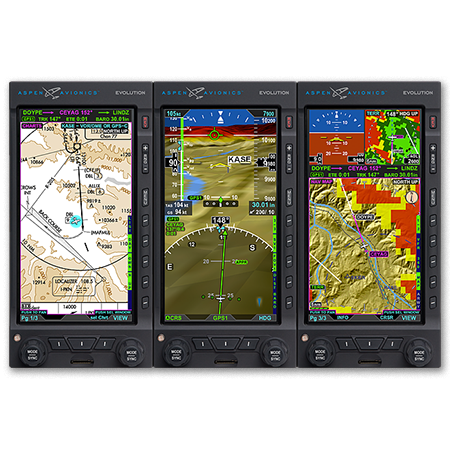 The Evolution 2500 from Aspen is a complete glass cockpit system, combining the EFD1000 Pro PFD (Primary Flight Display), the 1000 MFD (Multi-function Flight Display) and a 500 MFD to make a flexible and convenient three-screen display. Aspen’s Evolution 2500 provides exclusive DuoSafe PDF redundancy to your aircraft. Should your PFD fail, the touch of a button will convert the 1000 MFD unit into an identical backup reducing any potential confusion in a high-pressure situation in the air. Dual redundant backup batteries add still more safety features to the system. Within the Evolution 2500, the Pro PFD provides you with professional-grade EFIS primary flight instruments, moving maps and a feature rich electronic HSI. The 1000 MFD will double the display area of your panel, and provide full redundancy of all critical systems and sensors, while the 500 MFD adds to the package to deliver a large and incredibly flexible display area. With so much screen space you can view your approach chart and moving map at the same time, giving you the perfect opportunity to cross check your position. All of Aspen’s units are easy to install, with their unique retrofit technology which can reduce the installation cost for you as it’s likely you won’t need a new panel. And what’s more, all Evolution Flight Displays from Aspen can be upgraded, so if you wish to add any new features via software upgrades you can do so without removing the displays from your panel to save time and effort.